The Electronic Logging Device mandate went into effect on December 18, 2017. This mandate has caused confusion across the livestock industry, including how it affects the transportation of horses. 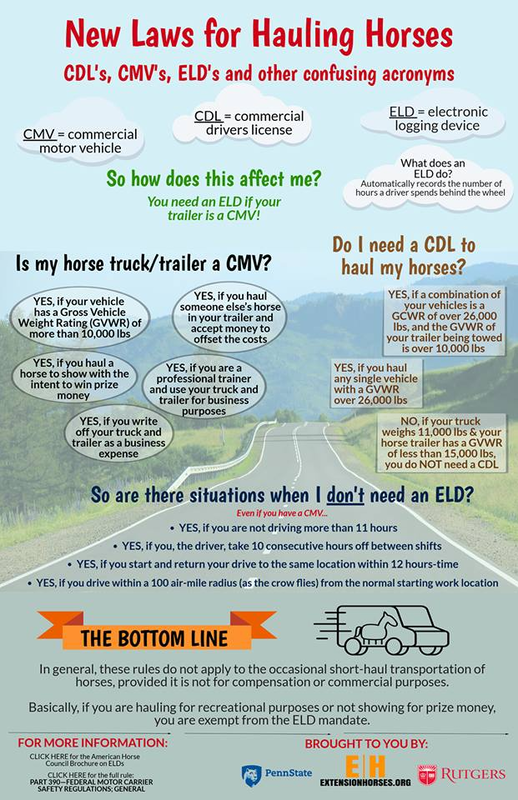 The American Horse Council has released a brochure sharing what the mandate requires, how it affects horse haulers, and exemptions from the ELD requirement for the horse industry. View the American Horse Council brochure here. Additionally, the following graphic helps to explain the terminology used in the mandate and what this all means for you if you are preparing to transport your horses. Additional information on Electronic Logging Devices and the ELD rule can be found at the Federal Motor Carrier Safety Administration’s website.